Bulls now 9-6, 3-2 on the road trip. The Bulls lost an early 14-point lead and didn’t get enough from a 35-point game from Jimmy Butler and lost to the Denver Nuggets 110-107. It was the Bulls 10th straight loss in Denver and 16th of 17. The Bulls fell to 9-6 and 3-2 on the road trip. The Nuggets are 6-8. Dwyane had 22 points, Rajon Rondo 13 points, 11 rebounds and eight assists, Taj Gibson 12 points and 10 rebounds and Robin Lopez 12 points and six blocks. Nikola Mirotic had 11 points off the bench, but the Bulls reserves were outscored 61-13. Denver got two free throws from Will Barton with 9.5 seconds left and then ran a three-point shot play for Isaiah Canaan that fell short. Doug McDermott remained out with a concussion and Michael Carter-Williams with a knee injury. 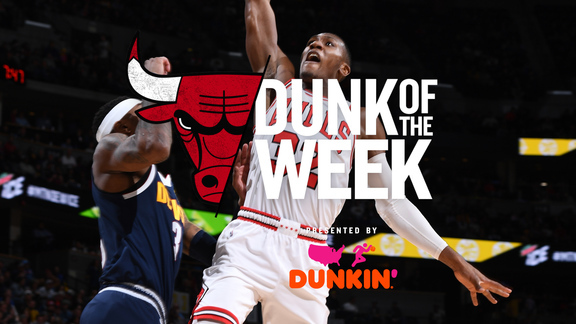 But the Bulls came firing into the game on all cylinders, East Player of the week Butler with 10 first quarter points in a 31-19 Bulls lead. The Nuggets were hanging in trailing 14-10 when Wade made a corner three and a fast break slam dunk after a steal igniting a 17-7 run. The Bulls would shoot 62 percent in another strong start, only to see the game turned on them going to the bench in the second quarter. The reserves played passively, mostly deferring to Wade, who was forced into off-balance shots. The sequence resulted in an overwhelming 24-0 Nuggets run, 22-0 to start the second quarter behind rookie Jamal Murray with 15 in the second quarter. That gave Denver a 41-31 lead, a 24-point turnaround after the Bulls led by 14 in the first. The Bulls recovered with an 11-2 run late in the second quarter with Mirotic scoring seven points, 10 in the first half as the only Bulls reserve player to score. Butler finished a lob dunk on a long pass from Rondo, Rondo with nine points in the first half and Butler with 17. Wade had a dozen. It enabled the Bulls to tie the game at 60 at halftime with a spinning Wade move to tie the game. 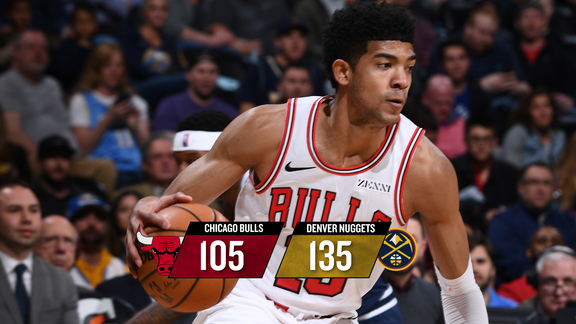 The Bulls regained their equilibrium to open the second half with the starters, taking a 70-66 lead before Nuggets center Jusuf Nurkic scored 10 points operating inside for a 79-76 Denver lead midway through the third quarter. 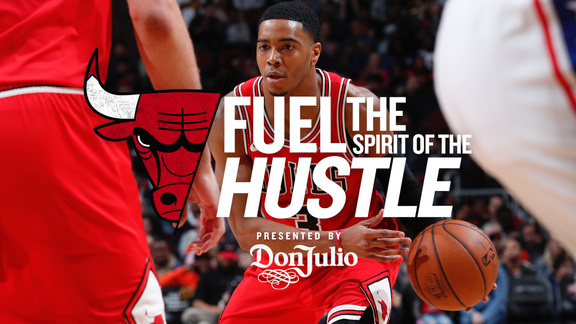 Again it was up to Butler to rally the Bulls back as he did with 10 of the Bulls last 12 points of the third quarter mostly on mid-range jump shots. That gave Butler 29 points after three-quarters as the Bulls went into the fourth quarter trailing 91-88. Murray with 24 off the bench through three-quarters was flummoxing the Bulls. The Bulls tied the score at 93 early in the fourth quarter on a Wade jumper. But the Bulls got stagnant with their offense, settling for quick jump shots as the Nuggets pushed the ball up fast for a 99-93 lead with 6:42 left in the game. The Bulls fortified their defense with Lopez and Gibson and some key rebounds from Rondo and pulled into a 99-99 tie with 4:58 left. Lopez was stout protecting the rim, but the Bulls offense stalled again and the Nuggets took a 105-101 lead with 1:40 left on a Danilo Gallinari three. Coach Fred Hoiberg leaped out of his seat holding his head as an apparent Lopez block with 1:07 was called a foul. But Butler tied it with a three, his sixth straight points in 29 seconds to tie the game at 107 with 37 seconds left.